(Natural News) Once again the so-called “mainstream media” has been caught producing content that is specifically tailored to suit a pre-ordained political narrative, rather than just reporting on what is. 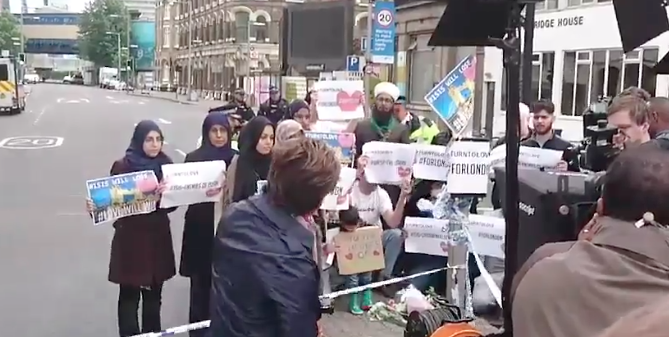 Both CNN and The Associated Press were caught staging a “protest” involving alleged anti-ISIS Muslims in Britain on the heels of the latest radical Islamic terrorist attack in the country’s capital of London over the weekend — this one again involving a vehicle-borne assault in which three terrorists ran down and stabbed scores of people, killing seven. As reported by The National Sentinel, screenshots of video produced by bystanders and suspicious British media figures, then shared on social media, clearly show that the so-called protest by a handful of non-radicalized Muslims was an attempt to support the narrative that hey, not all Muslims are violent and evil (as if anyone but the Left has actually been suggesting that). Both CNN and the AP were seen using the same small group of Muslims, and in each instance, were billing the protests as separate and spontaneous. But a closer examination of the photos shows that the people involved are the same. One follower wrote that it was almost like renting people of a certain ethnicity and faith in order to prove a point, and frankly, it’s hard to argue that. There are additional examples tied to this particular story but you get the drift: It’s just the latest attempt by political hacks in the “mainstream” media pretending to be journalists in order to put forth a certain point of view that otherwise may not exist, at least in the way it’s being portrayed. Given the fact that London has a Muslim mayor who was democratically elected certainly supports the contention by the AP and CNN that “not all Muslims are radical terrorists,” given that Sadiq Khan is no radical himself. Of course they would, and that’s the point. But here is the mainstream media making something up again to support their personal political perspective. What should also be noted is that this staged demonstration came just hours after the latest terrorist attack in a city and a country that is suffering more than their share of them. It’s like as soon as London authorities announced they had enough evidence to support the allegation that the attack was carried out by radicalized jihadists with loyalty to ISIS, the disgusting media jumped into action to mitigate the impact of the attack — and those killed in injured in it — with a counter-narrative that sought to avert everyone’s attention from what they know to be true: Britain has a radicalized Islam problem. As we saw by the reaction to the staged protest, not all British media types are supportive of the fakery. And some British citizens are also trying to convince the British to get their heads out of the sand and understand that separating the violence from the Islamic faith is folly. One of them is a one-time Islamic radical himself, Maajid Nawaz, a former leader of the UK branch of the hardline Islamist group Hizb ut-Tahrir (HuT). As reported by Breitbart News, he told a radio audience on London’s LBC radio in the wake of the Saturday attack to “stop pretending” that violence and terrorism are new to Islam. “When the prophet Mohammad said, ‘I have been ordered to fight the people until they declare there is no god but God and Muhammad is his messenger,’ that’s clearly got something to do with violence, doesn’t it?” he asked one caller, who responded that he would have to know the context of the sentence before deciding.